Greetings again from the darkness. Being wrongly accused of a horrible crime would be a nightmare. Being wrongly convicted would be the worst possible nightmare. Prison life must be a daily nightmare. What could make such nightmares even worse? How about serving 21 years for a crime you didn’t commit, with about 4 years of that in solitary confinement. Numerous recent projects have focused on a legal and justice system that sometimes seems broken. Some of the best include: HBO’s “The Night Of”, Ana DuVernay’s documentary 13TH, and Jamie Meltzer’s documentary TRUE CONVICTION. Writer/Director Matt Ruskin has adapted this most recent based-on-a-true-story docudrama from a podcast episode of “This American Life”. While the general topic of “justice” is interesting enough, it’s the individual personal stories of justice denied that add such power, immediacy and emotion. 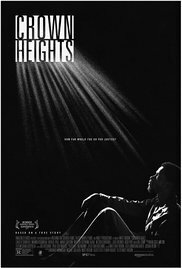 In April 1980, in the Crown Heights section of Brooklyn, a young man is arrested on suspicion of murder. Lakeith Stanfeld (SHORT TERM 12) plays Colin Warner, a local petty thief whose family is from Trinidad. The “suspicion of murder” is really not accurate, since the arresting cops knew Colin wasn’t the guy, but were more interested in clearing the case than actually solving it. What follows is a commentary on crooked cops, a flawed judicial system, and the willingness by the guilty party to let another go to jail if it means they remain free. However, more than any of that, this is a wonderful story of one man’s unrelenting pursuit of justice for his friend. Former NFL star Nnambi Asomugha (married to Kerry Washington) plays Carl “KC” King – Colin’s friend who refuses to give up on him and constantly hunts for someone to ensure justice is served … no matter how much time has passed. KC never stops, even when he realizes this is a system that doesn’t often admit its mistakes. The tenacity of KC is likely to have viewers questioning if they have a friend so loyal … or if they themselves could be such a friend. Supporting work is provided by Zach Greiner, Josh Pais, Luke Forbes, Marsha Stephanie Blake, Adriane Lenox, Nestor Carbondell, Bill Camp, and Yul Vazquez. Natalie Paul plays Antoinette, the saintly woman who falls in love with Colin and marries him while he is incarcerated. We watch as the wheels of injustice roll over Colin – even demanding that he admit remorse in order to have his request for probation considered. Being a man of strong conviction, Colin holds firm on his innocence despite being hardened by life behind bars. Director Ruskin has delivered a decent movie, but with its vital story and issue, it’s one probably better suited to a documentary structure. He wisely chooses not to pile on the legalities, and focuses more on the frustrations with a flawed system while also including an anti-death penalty message supported by the statistic of 2.4 million in prison – an estimated 120,000 of which are innocent. This entry was posted on Thursday, August 31st, 2017 at 8:39 pm and is filed under Drama. You can follow any responses to this entry through the RSS 2.0 feed. You can leave a response, or trackback from your own site.